President Lungu has called on new Permanent Secretaries for Administration and Technical Services in the Ministry of Health to avoid procrastination and lethargy as some of the vices which have been delaying service delivery. The President also warned that some Permanent Secretaries would soon be replaced because they were not performing according to expectations. The President said his investigations have revealed that some Permanent Secretaries were tired hence they would soon be replaced. The President said this when he swore- in Mr John Moyo as Permanent Secretary for Administration and Dr. Jabbin Longa Mulwanda, Permanent Secretary for Technical Services in the Ministry of Health. The President expressed profound concern at decisions which were made a long time on procurement of medicines and medical equipment including the execution of other health related activities, but were still pending. President Lungu cited decisions which were made during the reign of fourth Republican President, His Excellency Mr Rupiah Bwezani Banda but had not yet been executed and attributed this to lethargy among other reasons. 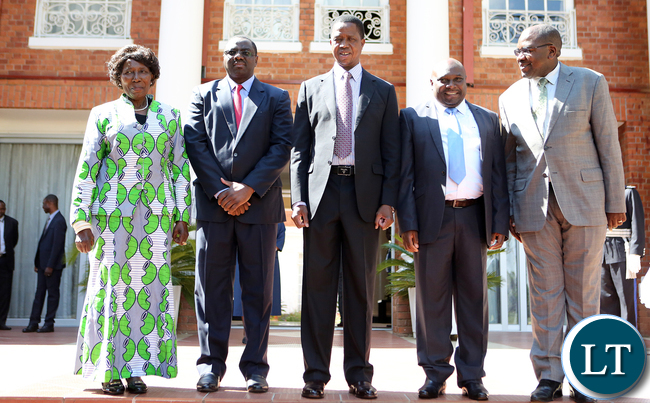 President Lungu stated that sometimes decisions were made to pend to cause Government to fail in service delivery. The President advised the two Permanent Secretaries to ensure that they executed their duties efficiently and that implementation of decisions made should be expedited to enhance service delivery. On the appointment and swearing in of two Permanent Secretaries in the Ministry of Health, the President stated that this was unprecedented and that the move was intended to enhance efficiency in the system, as it was constrained. And the President also commended the Minister of Health Dr. Chilufya Mulenga for introducing health living in the country through the promotion of Aerobics which were launched on 28th November, 2016. President Lungu said Health was not simply about curative but that emphasis should equally be on improving health living and wellness of the citizens to ensure a healthy nation. what has happened to my friend Dr. Peter Mwaba the longest serving PS from Mwanawasa’ time? I think Peter has served well and needs a rest. Peter was good. LT, if you do not know the name of the Minister of Health then this calls for serious diagnosis of your reporters. I end here. Dr. Mwaba is as good as they come. Sharp and quick thinker. His word is his honor. A real technocrat! Please give us a bit of background – academic and experience of these appointees. Do we have investigative journalism in this country? The ministry of Health is among the most corrupt in the Land. They charge patients money for modern and advanced test at private labs to determine the causes of the illnesses but they don’t send the specimen to where they should. Where do they take the money they are supposed to pay the private Labs and the couriers like DHL? Then the patient dies because of wrong diagnosis. How sad. there is the devil and his grafters somewhere in the system. the Presidents investigators should be looking at these issues. He’s very good at overseas trips and swearing-in ceremonies. The next time you hear of him he’s on some trip looking for investors to buy a million goats from Zambia. Really laughable…Lazy Lungu issuing advive he doesnt adhere to himself!! Dr mulwanda is a qualified surgeon. Mr moyo I don’t know. Whats a surgeon doing in the office instead of being in the hospital!! Very nice to see Dr Mulwanda promoted.He helped me solve a problem many years ago,that took me many different offices. His superiors at the time were of no help ,when I contacted him he solved my issue in minutes.I’m confident he will do well.I’ve always hoped God would bless him for his kindness. Iwe ka JAY JAY seems you dream ECL and even on your Toilet seat u check your poop if there is ECL there. He gives u night mares indeed such that the changes made in ministry health are related to Foreign trips in your small brain. Think before u post some things mwana. Remove that PS at PSMD, Boniface…the guy is incompetent and cannot handle labour issues professionally.